Helfa Gelf 2017, Christopher T Roberts back on the Trail | News by Wales Express News, People Before Profit! An artist who was part of the Helfa Gelf Art Trail in 2008 has decided to open his Prestatyn studio on 1, 3, 9, 10, 16 and 17 September 2017. The Helfa Gelf Art Trail takes place across the counties of Gwynedd, Conwy, Denbighshire, Flintshire and Wrexham from Friday to Sunday throughout September 2017. Artists pick the days they open their studios; more information is available at HelfaGelf.co.uk. Christopher is a realist expressionist living and working on the North Coast of Wales. He grew up in Bangor and has always been a creative person. As a teenager he studied under the inspiring tutorship of Iwan Parry and the great Welsh master Peter Prendergast at the Coleg Menai Foundation course. He completed a BA in Fine Art at Cardiff and has shown his work all over Wales, Liverpool and Chester. A recent work, ‘Tommy’, has been exhibited at The Grosvenor Museum in Chester. 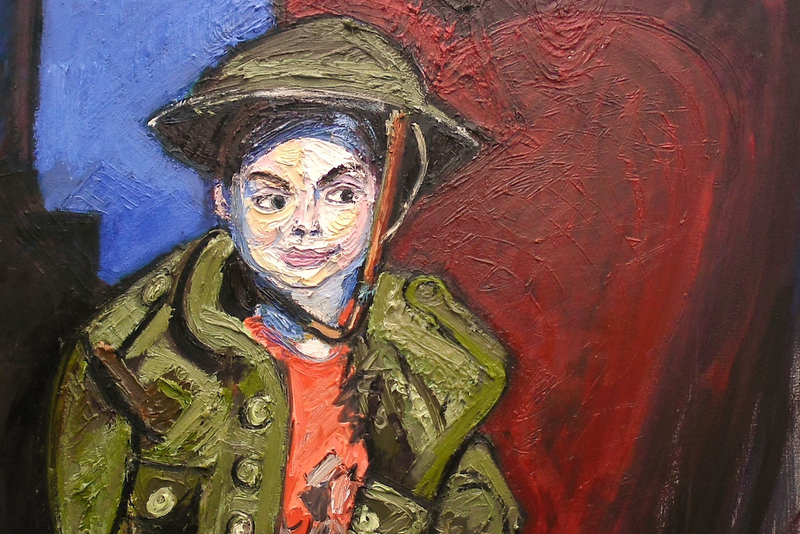 The painting was inspired by his son, Clark, who dressed up as a WW1 soldier while on a day out to the Green Field Heritage Park in Flintshire. The studio is situated in central Prestatyn, not far from the High School. Christopher’s work is also exhibited at Oriel Plas Brondanw, Gwynedd and The Carriageworks, Denbigh. “I enjoyed meeting the wide range of people who came to see me working in my studio, including: my local MP, the Mayor, serious art lovers, neighbours, friends, fellow artists and people who were curious and just wanted to know what it was all about. Helfa Gelf is a perfect opportunity for artists to raise their profile within the community they belong to, as well as become better known by the wider public at large. Helfa Gelf is funded by the Arts Council of Wales, supported by the National Lottery, and is sponsored by the Welsh Government; plus support from the Local Authorities across North Wales has allowed the development of the Helfa Gelf Art Trail. Criccieth’s Starlight Players are off caravanning this Summer!